Mention St Valentine and all sorts of images come to mind, red hearts, flowers, chocolates, messages of affection and gifts all associated with Romantic Love. Today St Valentine’s Day is second only to Christmas for the large number of cards exchanged and indeed it is a huge money-making industry. But who was St Valentine and how did he come to be linked with love and romance? 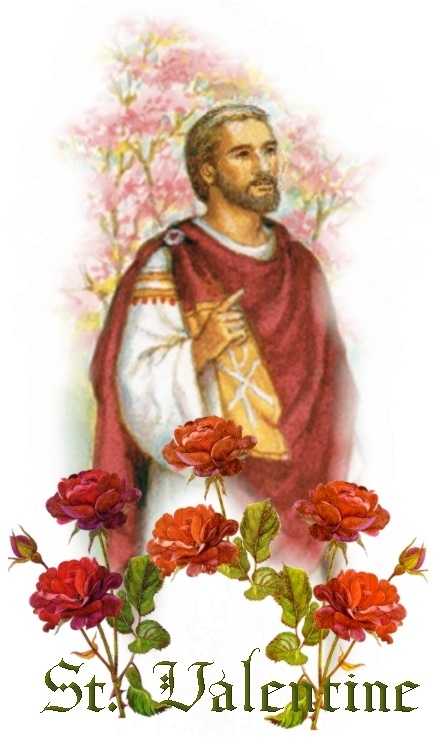 One popular belief about St Valentine is that he was a priest and physician from Rome in the third century AD. At this time Rome was the most powerful nation in the world and most Romans were pagan. It was a dangerous place for Christians who were mercilessly persecuted. Two Valentines are listed in the Roman Martyrology on 14 February: One the priest mentioned above, the other a bishop of Terni. As a result of the lack of clear records it is believed that these two Valentines were in fact one and the same. St Valentine is on the Catholic Church’s official list of saints, although because of the uncertainty about who he was, he no longer appears on the General Catholic Calendar of Saints. One of the reasons for the connection with love and courting couples is that on the date of their feast day birds are supposed to pair, a belief at least as old as Chaucer. In his poem the Parliament of Fowls, he imagined the goddess Nature pairing off all the birds for the year to come on “St Valentyne’s Day”. On the other hand some authorities see the custom of choosing a partner on St Valentine’s Day as the survival of elements of the Roman Lupercalia festival which took place in the middle of February – officially the start of their springtime. It was once thought that as part of the celebrations, boys drew names of girls from a box. They would be boyfriend and girlfriend during the festival and sometimes they might even later marry. However some scholars maintain that this is an invention from the eighteenth century. Whether or not this is true it happened that in 496 Ad, Pope Gelasius decided to put an end to the feast of Lupercalia, and he declared that February 14 be celebrated as St Valentine’s Day. There are several legends which grew up around the cult of St Valentine. One story is that Valentine the Christian priest became well known during the reign of Claudius II, known as Claudius the Cruel. At the time of his rule Rome was involved in many bloody and unpopular campaigns. There was therefore, a reluctance on the part of many to enlist at the very time Rome needed a strong and powerful army. The emperor believed the men stayed away because of attachment to their wives and families. In an attempt to sort this problem out he banned all marriages and engagements. The church thought that marriage was very sacred, a sacrament between one man and one woman for life and that it was to be encouraged. Valentine was interested in enabling them to marry within the Christian church and so continued to perform marriages in secret. When his actions were discovered Claudius ordered that he be imprisoned before being brought before the Prefect of Rome to account for his crime. One of the men who was to judge him was a man called Asterius, whose daughter was blind. It has been said by some that he cured this girl and as a result her father converted to Christianity. In other accounts it is claimed that Valentine fell in love with his jailer’s daughter. Before his execution on February 14 he sent her a love letter signed “from your Valentine”, and in doing so inspired all future romantic messages. The earliest known love notes were written on handmade cards, often with extravagant verses of poetry describing the love the sender has for the recipient. These beautiful creations were elaborately decorated with picture, lace and ribbons and were kept as treasured mementoes for many years. Over time, the tradition of sending cards became more widespread as postage services and printing improved. In Ireland we have a special reason to celebrate St Valentine. 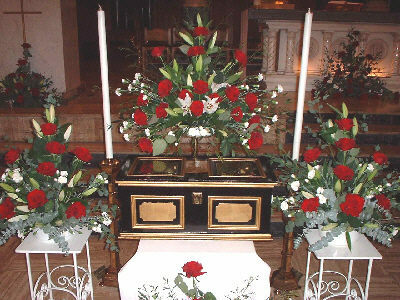 Some of this famous saint’s remains are reputed to lie in Whitefriar Street Church, Dublin. In this eighteenth century building an alarmed casket contains a number of his bones and a vial of his blood. The relics have been there since 1836, when Dublin preacher Fr John Spratt was given them as a gift by Pope Gregory XVI. The statue of the saint was carved by Irene Broe and depicts the saint in the red vestments of a martyr holding a crocus in his hand. On February 14 the Reliquary is removed from the side-altar and is placed before the high altar in the church and venerated there at the Masses. Why not pay a visit if you can, light a candle and offer a prayer to the Saint of love, something we all need to give and receive. Have a lovely St Valentine’s Day!